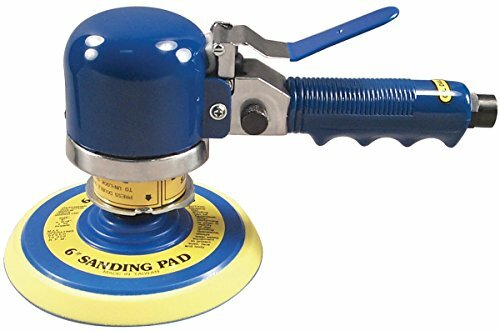 The Astro Pneumatic 300SP 6" DAQ Random Orbital Sander with Pad - Regular Duty - 9,000rpm DAQ - Dual Action, Quiet Performance. Used for feather edging, metal preparation and finish work on body filler. Built-in silencer and motor insulation provides quiet operation. Balanced ball bearing construction for vibration-free performance. Built-in regulator for positive speed control. Specifications: Disc Size: 6", Free Speed: 9,000rpm, Orbit: 3/8"(9.5mm) Orbit Stroke, Overall Length: 9-1/2" (241mm), Net Weight: 4-1/4lbs. (1.92kg), Spindle Thread Size: 5/16"-24, Air Inlet Thread NPT: 1/4", Air Hose I.D. Size: 3/8" (10mm), Avg. Air Consumption: 5cfm, Air Pressure: 90-120psi.